Mail made of Mithril that was owned by Bilbo Baggins. It was a gift from Thorin Oakenshield, who got the mail from Smaug. It was made with many great and valuable jewels and gems, including mithril, an especially valuable mineral in Middle-Earth. Though the mail was made for Elves, it fit Bilbo perfectly. In fact, he wore the mail to the Battle of Five Armies, which took place in 2941. After the Battle was won, Bilbo returned to the Shire with his valuable mail and gave it to the Mathom-house Museum in Michel Delving. It hung there until 3001, when Bilbo set out for Rivendell with his mail. It remained in Rivendell until 3018, when Frodo Baggins came there with his Ring of Power, which he intended to destroy in Mount Doom. Since Bilbo had little use for the mail in Rivendell, he gave it and Sting to Frodo. 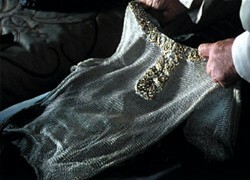 Frodo did not wear the Mithril Mail that often. But in Moria, he was nearly killed and the strong mail he was wearing saved him. In 3019, Frodo was attacked by Shelob in her lair in Cirith Ungol. Samwise Gamgee thought his master to be dead and left the Mithril Mail behind, taking only the Ring. Shagrat and Gorbag, orcs of Cirith Ungol's Tower, took it to the tower, along with Frodo. A battle over the mail happened and all died but Shagrat, who took the mail to Barad-Dur giving time for Sam to free Frodo. The Mouth of Sauron soon took the mail and showed it to Gandalf, who was scared for Frodo. The Mouth also said that Frodo and Sam were dead and the Ring was in Sauron's possession, which was untrue. At the Scouring of the Shire, Saruman attempted to stab Frodo. But he was wearing his Mithril Mail, and remained unscathed. Saruman was then stabbed himself by Grima Wormtongue and the mail received an unknown fate.